Correx Gram Force Gauges are manufactured by Haag-Streit, in Switzerland. This is the ideal all-mechanical instrument used to measure and calibrate the pressure or force required to actuate micro switches, relays, electric contacts, friction torque, etc. In aviation they are used as a component in Lift Transducers manufactured by Tronair and others. The feeler arm can be chemically sterilized for use by orthodontists, for tooth implants and in pediatric dentistry. The rest of the gage can not be sterilized or autoclaved. Piano technicians will use the force gage to standardize hammer mechanisms. University labs have used the gages to measure biological response threshold. Thread and yarn tension in sewing and weaving machines. Repair shops, like us, use the gage to set proper return spring tension. The Correx force gage fits easily in the hand, weighing from 4 to 9 oz. Except for the smallest 2 models, all have a maximum pointer. They have been variously sold as tension and compression gages; more recently as dynamometers. The dials are graduated in both gram/pond and centi-Newton. We only offer the genuine made in Switzerland Correx tension gauge. Correx model 7220407 is shown above, measuring up to 30 cN in either direction with a round feeler. The round tip is a flattened sphere, about 1 mm in diameter. The feeler length is 1.25 inches. The flat tip (1.25" long) is illustrated above. Notice that both of the gages shown on this page have maximum pointers which allows you to take a measurement without having to observe the dial. Maximum pointers are not available on the two smallest gages (3 cN and 6 cN). When taking measurements or when calibrating, it is important to keep the feeler at right angles to the direction of force at all times. Changes to this angle will result in erroneous readings. New Correx force gages do not come supplied with certificates of calibration although the manufacturer guarantees accuracy. If certificates traceable to NIST are required, then we can provide them at an extra charge if requested at time of purchase. If ordering online, be sure to make this request. Allow an extra 2 days for certification. The dials are graduated both in grams/ponds and centi-Newtons (see notes below). Dial diameter is 37 mm (up to 250g) and 65 mm (from 500 to 2000g). There is no difference between previous black-bodied models and the current purple version. All gages are in stock. Distributors and repair shops may qualify for discounts. Correx gages have been around for at least 50 years and the only change has been a switch from a funereal black body paint to this current designer aubergine. As a note of interest, in 1978 the price for the 100 cN gage was $39 (as sold by Alina Corporation, the exclusive importer of Correx at the time). You may order online by selecting any linked model number above. Flat or round feelers? See photos at the top of this page. You may order online by selecting any linked model number. Correx feelers come in two forms: the flat feeler (somewhat like a screwdriver blade) and the round feeler (which actually comes to a blunt point). These feelers are solid, non-magnetic metal. There is no pre-drilled hole like you'll find in some other force gages. It's important to acknowledge that any modification to the feelers is likely to affect the gage's calibration. If you're tempted to drill a hole through the flat blade, then make it as close to the tip as possible and only as large as necessary so you don't drastically change the mass of the feeler arm. The Correx force gage measures most accurately at the very tip of the feeler and that's why you want to make sure all forces, including hanging weights, are applied as near the extreme tip as possible. The feelers are made of a relatively soft and pliable metal. If it ever bends out of shape you can easily straighten it with your fingers. If they're damaged beyond help, we can install a new feeler for you. Newton (N): In the meter-kilogram-second system, the unit of force required to accelerate a mass of one kilogram one meter per second per second, equal to 100,000 dynes. The inner scale on the Correx force gage is calibrated in centi-Newtons. The outer scale on the dial is calibrated in grams and ponds. This outer scale is used for calibration purposes when weights are suspended from the feeler arm. Pond: the metric unit of force seen on the outer scale of the Correx force gages. A pond is the gravitational force at mean sea level on a mass of one gram; thus it is equal to .980665 centiNewtons. The pond has disappeared from many applications because it is not an International Standards (SI) unit. Here are the equivalent model numbers as used by SPI and other distributors. If you know their number, then you can find our number. In early 2015 Haag-Streit changed their model numbers once again. When placing an order, please use the NEW Haag-Streit number whenever possible. You will notice that we also provide a descriptive number giving the gage's maximum reading followed by the letter F for flat feeler or the letter R for round feeler. 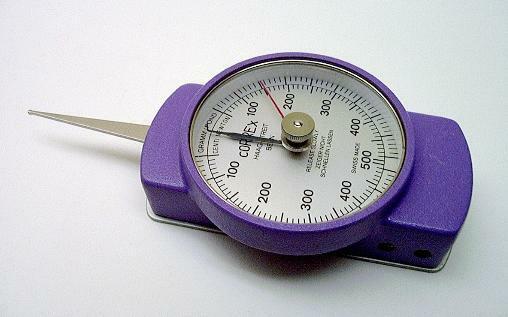 Calibration of the Correx force gage is effected by suspending the appropriate weight from the very tip of the feeler arm. During this process, the arm must be kept horizontal. The reading should then be taken on the gram/pond scale of the dial. The gage should be tested at 2 or 3 different portions of its range, in both directions. If the instrument does not calibrate according to tolerances as calculated below then it must be returned for servicing either to us directly or to another qualified repair and calibration shop specializing in mechanical tension gages. Calibration can also be effected using non-mechanical force measuring equipment for comparison. New Correx force gages do not come supplied with certificates of calibration. However, the manufacturer guarantees that they are accurate according to the above calculations. If NIST traceable calibration certificates are required you will have to request them at the time of purchase (fee applies). Alternately, you may send them to a calibration lab of your choice. We can not provide calibration certificates after the purchase has been made. Correx force gages may be returned to us for calibration at any time. The manufacturer suggests a 3-year calibration cycle. If the gages do not calibrate correctly, you will have to consider purchasing a new gage. Take note: we can not calibrate any Correx gage whose feelers have been modified in any way whatsoever. Please note: We have removed calibration instructions from this page at the manufacturer's request. The manufacturer advises us that repair tools and calibration equipment (weights and adapter sleeves) are currently not available for sale. Furthermore, the manufacturer does not encourage end-users to perform their own repairs or calibration. Long Island Indicator Service has this equipment and we can perform these calibrations for you. Special thanks to Russ Rowlett of the University of North Carolina, Center for Mathematics and Science Education; Sunit Mahajan of the Thayer School of Engineering at Dartmouth College; and to Laurent Gasser of Haag-Streit, Switzerland. The Correx gage will remain accurate as long as you don't open the back cover and attempt to make any adjustments to the springs or the screws you'll find inside, and as long as you don't alter the length or shape of the feeler arm. The manufacturer suggests re-calibration every 3 years, but you may want to do this more frequently if you're suspicious about the way your gages have been handled. On the surface, you may find that the feeler arm has become bent. It is a soft metal and you simply bend it back into shape using just the pressure of your fingers. Resort to small pliers only if necessary. When bending, keep in mind that the arm moves on a pivot inside the gage. Too much pressure will break the pivot resulting in a costly repair. If the arm is badly damaged, it can be replaced (send it to us for repair). If the dial hand gets stuck, it may be touching the dial or the glass or, most likely, the white plastic spacing ring which is just underneath the dial. These are things you can probably correct yourself. Remove the ring which holds the bezel in place and the crystal will come out easily. Now you gently bend the hands as necessary, or you can rotate or reposition the spacing ring so that it isn't in the way. If the crystal is scratched or the tolerance hand no longer functions, just replace the entire crystal, which can be ordered from us. The hand may not always return exactly to zero. You will have noticed that there is, in fact, no zero on the Correx dial. As long as the hand returns to this neutral, unmarked zone and if the gage calibrates correctly, there is no need to worry. 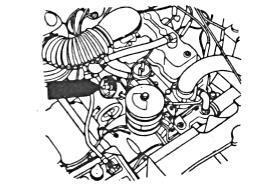 After long and heavy use, especially in corrosive environments, the bushings may wear out, giving a lot of play to the hand or to the front pivot. You may have to consider replacing the gage at this point, since that can't be corrected. Other problems arise if the gage is dropped or hit, or if it becomes contaminated with liquids or dust. You will want to have it professionally serviced and subsequently calibrated. As with any precision gage, store these in clean, safe places when not in use and always be on the lookout for problems which might affect the accurate interpretation of your data. There's a Swiss axiom that says "fix it before it's broken". Something to ponder. Correx mechanical gram force gages are unquestionably the best made instruments of this type. The manufacturer states that they are maintenance free and should be checked for calibration accuracy once in three years. Correx gages are not considered repairable. If they malfunction or no longer calibrate correctly, you should consider replacing them. If you send us a Correx gage for repair or calibration and it does not pass, then we will offer your trade-in for a new gage with a 20% discount. Sorry, we do not sell or repair other brands of force gages such as Arpo (made in France). We do not have spare parts for these and do not have necessary calibration equipment. You may wish to replace these with a current Correx model as shown on this page. "The Haag-Streit product must be used only for the purpose and in the manner described in the literature distributed with the product. The product is warranted against defective materials and workmanship for the period of one year after purchase. This warranty extends to the original purchaser from an authorized Haag-Streit dealer only." Spare parts are currently not available for sale. We no longer ship Correx force and tension gauges to international destinations (outside of the United States of America). For the benefit of importers and exporters selling these gages, the following information will be useful. Harmonized Tariff Code for these gages is 9024.80.0000 (dynamometer - dinamómetros). US Export Schedule B code is 9017308000. Adjusting spring tension in micro switches and all types of relay contacts. 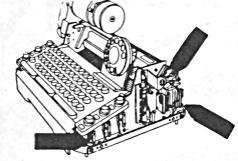 Typewriters of yesteryear or keyboards of today. Toggles and contacts with adjustable frictional torque. Car, motorcycle and engines of all kinds. Pick-up weight of vinyl record player arms; pressure of tape recorder pad. Q: I am confused by all of the models. I am an orthodontist and I need a gauge to measure up to about 300-350 grams. Which model would I need to get? A: Most orthodontists use the 250 cN gage with a round feeler. If you need to meaure a higher force, the next larger model is 50 to 500 cN. It is physically also larger and you may find it cumbersome to use. Take a look at the description on this page. Q: Is it okay if we apply more tension than the gage's range? For instance, can we apply 4 cN on a 3 cN gage? A: Yes, you can apply more, within reason. The gage simply will not register anything above the upper limit, when you exceed its range, but no harm will be done. Q: The hand on my Correx doesn't always return to zero. A: You will notice that there is, in fact, no zero on the dial. As long as the Correx calibrates correctly, and the hand returns to this neutral unmarked zone, there is no need to worry. Q: Can I adjust the hand on my 500 g Correx? It's no longer on zero. A: If the gage calibrates correctly, then the zero point is unimportant. It just looks odd. A 500 gram gage can not be adjusted and if it is under warranty should be returned, but… as far as I've seen, they always ship with the pointer pretty close to what appears to be zero (of course, there is no actual zero on the dial and this is done on purpose). If the hand has drifted away, we could assume that the gage was mishandled. Instructions say clearly that the hand must not be allowed to "snap". This is easier said than done, in practice. Repeated snapping can throw the mechanism off. In no case should the hand be removed and repositioned. The gage will no longer be accurate after that. In short, we would not be able to repair this.